Explore different meanings of home based work for women in Britain from the early nineteenth century to modern day. Today, over four million people in the UK work from home. These kinds of jobs often give greater autonomy and flexibility for workers. Women are still more likely than men to juggle caring commitments with paid employment. Home based work thus often seems to promise a more harmonious blend between career and family. Yet working at home has a more complicated and precarious history for women. Over the past two centuries Women's "natural" preference for jobs which fit with domestic responsibilities has been widely assumed. Waged work performed by women at home in the past was often poorly paid and physically gruelling. It also offered little opportunity for progression or creativity. Some women embraced homeworking as a positive choice, but for many others it was the least worst option. It was the only choice in a labour market dominated by gender segregation, unequal pay and limited childcare provision. The display is created by photographer Leonora Saunders and historian Helen McCarthy. 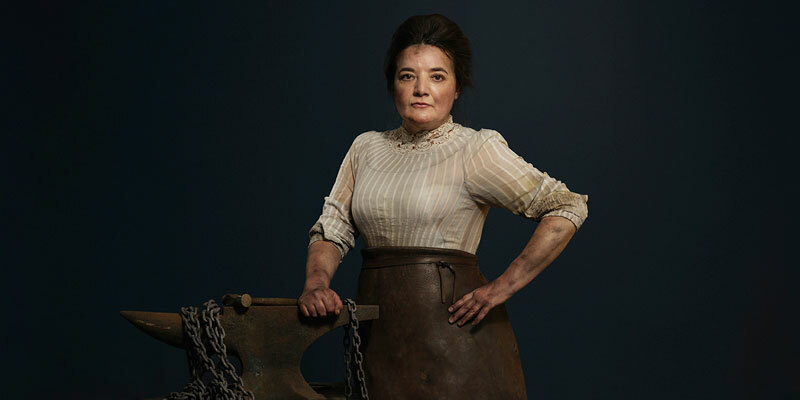 Each image reimagines the life of a woman who laboured for pay in her own home, from the Victorian seamstress and Edwardian chainmaker, to the postwar childminder and late twentieth century entrepreneur. The models have their own personal connection to home-based work. Their stories bring the past into dynamic conversation with the present. Share your story with us. Write on the memory wall or on Twitter, using the hashtag #TheseFourWalls.